Even as the Great Recession was raging, average comics cover prices continued to increase until 2010, when DC rolled back most of its line from $3.99 to $2.99. The move was, to paraphrase one insider, one of the most popular yet least financially successful moves the publisher had tried; even with the price drop, comics sales continued to struggle until the DC relaunch in the fall of 2011. In the years since, most of DC's line had risen back to $3.99 — when for "Rebirth" DC determined to have a price drop coincide with its relaunch event, with returnability on the first few issues thrown in to boot. The result continues to resonate in the Direct Market, as DC placed 39 titles in the Top 50 in September. Click to see the comics sales estimates for September 2016. 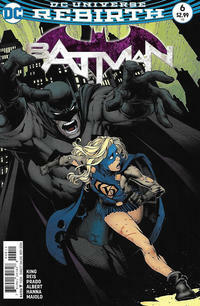 Batman #6, the first of the fully nonreturnable issues, led the charts with orders of nearly 139,000 copies. That's a hard number, not reduced for returns. Batman #5, the previous month, shipped about 158,000 returnable copies, of which 142,000 were reported in the charts; so retailers ordered nonreturnable copies at about 88% of their returnable levels. That suggests both that were pretty sure about selling most of what they ordered, and that they had already honed in their returnable orders close to demand levels. One consequence of the price drop is that while unit comics sales were up 23% in the third quarter over the same period last year — more comics were sold in the Top 300 than in any quarter since the fourth quarter of 1996! — comics dollar sales were only up 18%. So it's still open to question how well 2016 will finish out versus last year: we're up only $11 million, or less than 3%. A factor in that will be how well trade paperbacks perform into the holiday season, and there again we've seen another impact of Rebirth: graphic novels were off 9% in the third quarter, likely as retailers directed more dollars towards comic books. Walking Dead Vol. 26 led the September charts with nearly 21,000 copies ordered. This marks the beginning of the 21st year I've been tracking monthly comics sales — read more about that here — and as such, we can now do 20-year comparisons with what was sold in September 1996. That month was the first month of Marvel's "Heroes Reborn" mini-reboot, and we can see a number of things right away. Sales volumes on the major titles were much higher in 1996: Led by Jim Lee's Fantastic Four #1, September 1996 had six titles over 200,000 copies and 23 over 100,000; September 2016 has none over 200k, and only four in six figures. But the titles from the smaller publishers weren't as strong back then: by the time you reach the 300th place title, September 1996 is at parity with September 2016 (4,223 copies versus 4,239 copies). And September 2016 has many more titles below 300th place. The most important thing to remember about these cross-time comparisons is that the largest factor in determining Direct Market comics levels across time is the number of comics shops. At this time in 1996, we still had between 4,500 and 5,000 comics stores — well over what we have today. But shops then were closing swiftly, and today we're seeing modest growth. The average comic book in the Top 300 cost $3.87; the average comic book retailers ordered cost $3.61. The median and most common price for comics offered was $3.99. Click to see comics prices across time.